If you have been a regular follower of my recent genealogy adventures, you will know the past few months have seen me eyeball deep researching my father’s ancient maternal roots along the James River corridor in Virginia. I have previously written about this journey in the article Ghosts in the DNA: The lost diversity of early colonial Virginia (https://genealogyadventures.net/2018/07/23/ghosts-in-the-dna-the-lost-diversity-of-early-colonial-virginia). Unravelling this tale has resulted in some side journeys as I research the enslavers, and their enslaved people, who lived along the James River. Both the enslaved, and their enslavers, are my ancestors. Researching either group of people informs how I piece together a robust research strategy in order to reveal more of my family’s history. My journey has brought me to the Christian family of Henrico, Charles City, Goochland, and New Kent Counties in Virginia. I initially thought this part of my journey was an off-ramp or a cul-de-sac. By this I mean that it would be an interesting detour with no real implications for my ancestry – apart from a select few members of the Christian family who enslaved my 3x great grandfather, George Henry Roane, his wife, and their children. It turns out that this road is far from being an off-ramp taking me away from my core James River genealogical research. Nope. I’m on a parallel road that will connect back to my main research at some point. So how did I get on this side journey? 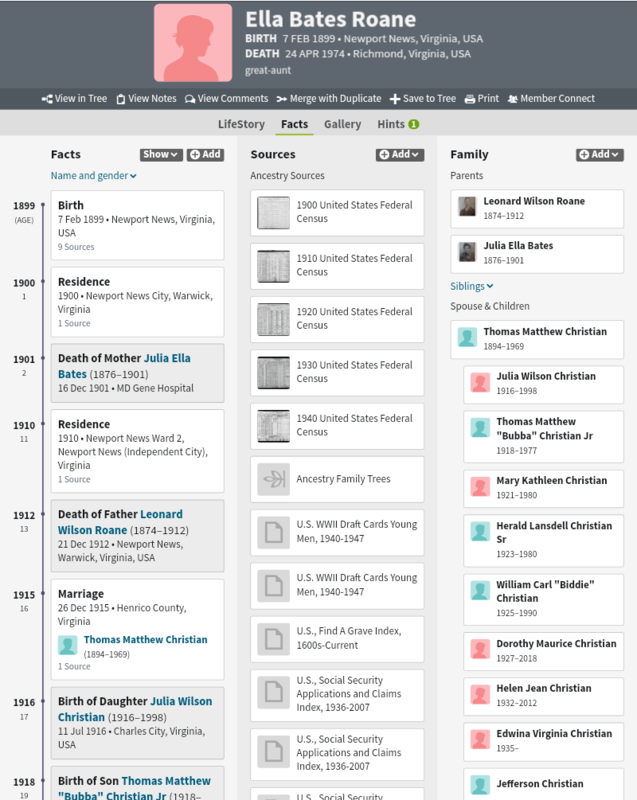 My paternal grandmother, Susie Julia Roane Thomas Sheffey’s, older sister, Ella Bates Roane, married Thomas Matthew Christian of Charles City County, Virginia. Thomas’s Christian family were descended from a long line of free people of colour. Thanks to tax records, land records, freedom affidavits filed at court (free people of colour had to go to court to prove they were legally free), probate records, court cases, etc I built out Thomas’s family tree. 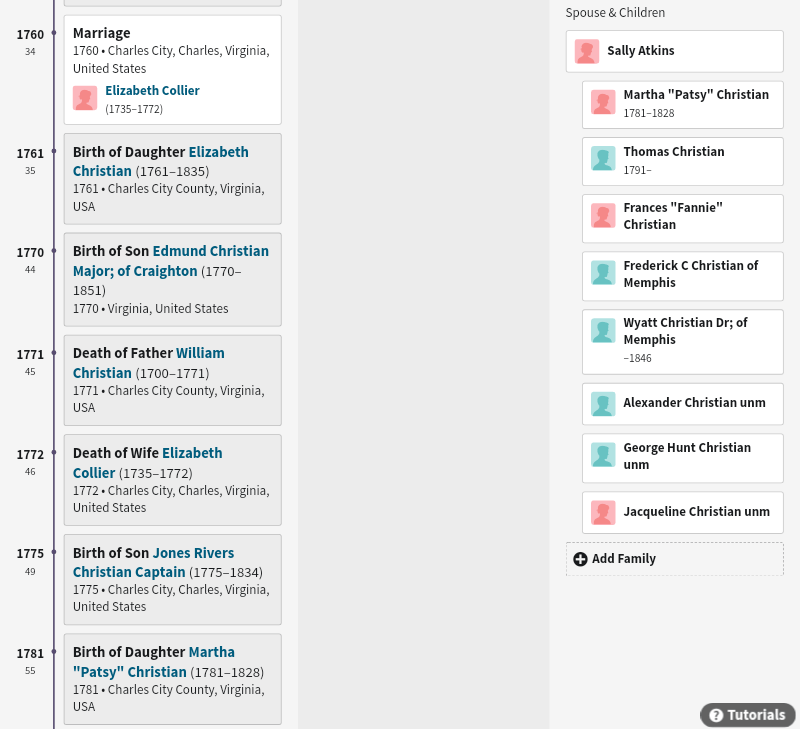 Digging around in my Christian family DNA matches, I found matches who were descendants of Ella and Thomas. And then I began to find Christian DNA cousins, black and white, by the dozens who weren’t descendants of Ella and Matthew. These individuals should only be relations by marriage. And, as such, we shouldn’t share any DNA as we have no common ancestors. Yet, there they were…and so many of them!! Added to Christians, I had strong matches on descendants from families close allied to, and entangled with, the Christians, and resident in the same counties I’ve cited: Minge, Shields, Collier, and Warren, to name a few of the families. Somewhere, in my father’s maternal direct line, there’s a Christian family member. The natural, initial question was who? Re-examine George Henry Roane’s lineage for potential clues. This part of the case study should really have the subtitle There’s Something about George Roane. Just for the simple reason that there is something about this man. His story really has only barely begun to be told. After Emancipation, he was a farmer. His sons, would go on to become a Justice of the Peace, another a policeman, yet another a councilman, and yet another a successful entrepreneur. These achievements played out during the early Jim Crow Era. I returned to the Will of the man who was his second-to-last enslaver: Edmund Christian. Yes, you read that surname correctly! Christian. Note: The George named in this will is my 3x great grandfather, George Henry Roane, with his wife and children. The Susan that’s mentioned is Susan Price, who married my 3x great grandfather Patrick Henry Roane (George’s son. Patrick is named in this will too). (??? )= word(s) that are indecipherable in the original document. I Edmund Christian of the County of Henrico in the State of Virginia make and declare the following as and for my last will and testament. I give to my daughter CHRISTIANA in addition to what she has under my feed of the fifth of January 1844 all that she may owe me at the time of my death and all the property in her possession which I purchased at the sale of her husband’s estate of at any time since. I give to my granddaughter JUDY MINGE CHRISTIAN a little girl named CAROLINE and one thousand dollars and also any increase the said Caroline may have to my grandson EDMUND C MINOR a little boy named WILLIAM and to my grandson GEORGE G MINOR a little boy named HENRY; the said CAROLINE, WILLIAM, and HENRY being children of a woman named HARRIET. And I give each child of my son WILLIAM that may be living at the time of my death of born within ten months thereafter a slave as near as may be to the age of the child that the slave will belong to. I give to my daughter EDMONIA the following slaves to wit: ELIZA, the wife of GEORGE, and their six children to wit: PATRICK, GEORGE, PRISCILLA, ANTHONY, EDMUND, and JOE, and also a mulatto girl named SUSAN and the increase of the females of any of the said slaves whether born before or after my death. I give to my daughter CAROLINE the following slaves to wit: KELLY, HARRIET, ABRAHAM and FANNY, and the increase of the females of any of them whether of (can’t read) other than her husband or his representatives. And in further trust that at any time before the same shall so devolve on such next of him, the trustees or trustee may (???) The said sums of twenty thousand dollars, or either of them or any part thereof in stocks or other property or (???) so investing may well The whole of any part of such stocks or property, and invest the proceeds thereof or any surplus interest of profits in other stocks or property or land (???) or such proceeds of surplus on good security and whatever may be so invested or so level-out shall be upon the same trusts that are before disclosed and these may from time to time as often as to (???) trustees or trustee shall seem advisable be unchanged in the more of investment or the whole of any part of the trust – subject – provided the proceeds be invested on the same trusts. I appoint my son WILLIAM, my friend LOFTON A ELLIOTT and my son-in-law GEORGE G MINOR executors of this my will and direct that they shall not be obliged to give security. I also direct my estate not to be appraised. In witness whereof, this will is signed by me this tenth day of March 1851, after first striking out on Page three the words “while he sometimes (??? )” and the words ” or marriage ” and after investing in Page 2 the words “or profits thereof and on Pages 2 and 3 the words “or profits” in 3 places. (Signed by Edmund Christian, with Seal). The foregoing will was acknowledged by Edmund Christian in the presence of us who were present at the same time and subscribed this will in his presence. It is my desire that my daughter EDMONIA may take from the furniture that I may leave what furniture she may require for chamber furniture; and that my carriage and horses may be for the use of my daughters Edmonia and Caroline. Though my servant GEORGE ROANE who has been in mindance of me will be subject to the management of my son WILLIAM, yet I wish him exempt – so far as practicable – from any liability to be sold for my son’s debts. George has been a faithful servant and I wish my son to give him annually about thirty dollars. Signed by me this eleventh day of March 1851. (Acknowledged by Edmund Christian and witnessed by the same men who witnessed his will). I have read and archives literally hundreds of enslaved-ancestors Wills and estate inventories. I have seen enslavers leaving bequests to some of their enslaved people: clothing, tools, trinkets, etc. – even freedom. But never money, much less an annual annuity. Note too how differently George was treated in comparison to Harriet and her family…All while remember they were both enslaved. It’s worth noting that $30 in 1851 was a significant amount of money. To put it into perspective, $30 in 1851 is equivalent in purchasing power to $866.32 in 2019. Was Edmund making a provision that would have enabled George to buy his freedom, and that of his family? Possibly. While it’s an intriguing notion, I haven’t found anything to support that. Just what the neck was going on here? Quick back story: George, his wife Eliza, and their eldest son Patrick were sold by George’s grandfather, Spencer Roane, to Edmund Christian right before Spencer Roane quit Virginia for Tennessee with his wife Anne Henry, a daughter of Patrick Henry. I’ve thought that Edmund was chosen because he was a kindly man (ok this is slavery we’re talking about, so I’m not comfortable with the word ‘kindly ‘, but can’t think of a suitable word to use). However kindly Edmund may have been, I think Spencer Roane had another motive for selling his grandson and great grandson to Edmund Christian. I believe Spencer was sending George from his white family on his father’s side his white relations in his mother’s side. Pay particular attention to the codocil. I initially thought George was left this because he was the great grandson of Patrick Henry, and the grandson of Spencer Ball Roane, who was a leading American political figure in his own right. These were facts everyone in George’s sphere knew. However, now I’m thinking Edmund left this annuity to George because they were related to one another. Did George go from one enslaving family member he was related to to another? Image showing the only places in my dad’s part of the family tree that could directly connect with the Christian family. I am specifically seeking a Christian family male at the 4x grandfather level, resident in Henrico County, Virginia, and old enough to have fathered a child around 1790, with biological ties to families like Minge. 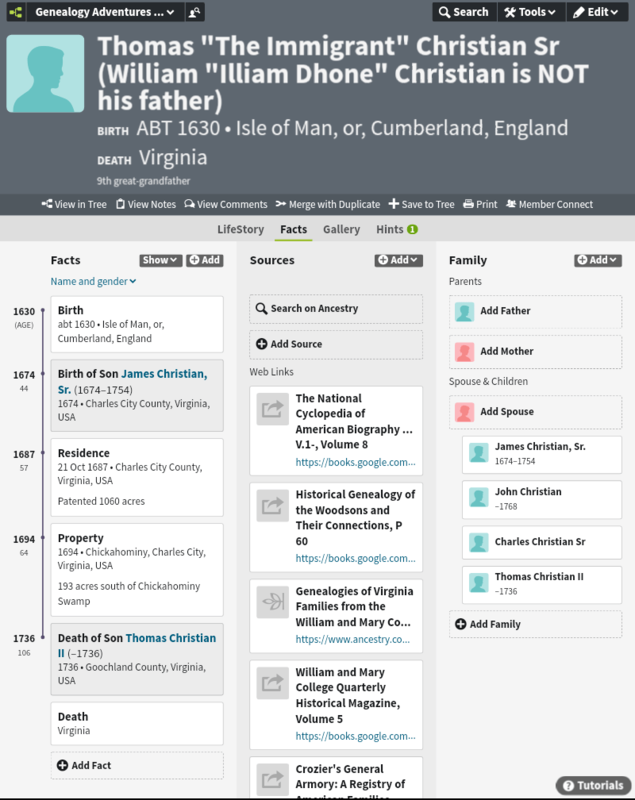 While there are other lines in my father’s ancestry that could be hiding a Christian ancestor, it makes sense to begin this part of the journey within George’s immediate family. After all, he was enslaved by a Christian family member who made an incredibly unusual bequest in his Will. George’s paternal line is done. A question mark hangs over his mother, Elizabeth’s, maiden name. Was she Elizabeth “Betsy” Christian? If so, she could be Edmund’s sister, making George his nephew. It would explain dozens upon dozens of white Christian, Jordan, Fleming, Pleasants, Woodson, Shields, and Minge DNA cousins who are my 4th, 5th and 6th cousins. Eight weeks of wrangling with cMs, SNPs, and records consistently brings the team to the man below, William Christian of Cherry Bottom in Charles City County, Virginia. The manner in which the DNA is stacking up points to one of his son’s being my missing Christian ancestor – the man who would be George Roane’s grandfather via his mother. I’ve been doing this kind of research for a long time. I have learned to listen to, and respect, my hunches. These hunches rarely let me down. Eventually, one way or another, my hunches are usually proven to be correct. Different research methodologies and records keep leading me back to this family line. William Christian married twice. I’ve already ruled out the sons he had with his second wife, Sally Atkins. They were simply too young to have fathered any children around 1790, when George Roane’s mother Eliza was born. 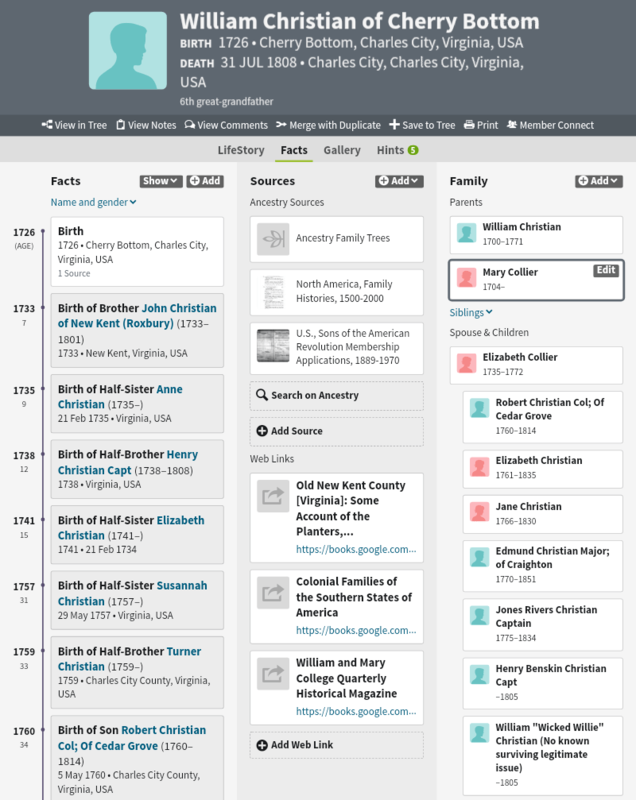 Researching his sons by Elizabeth Collier, I have ruled out all but 4: William “Wicked Willie”, Henry, Jones Rivers, and Edmund. Wicked Willie is proving the most likely candidate, albeit for fairly superficial reasons. Of the 4 brothers, Willie was the right age and in the right place at the right time. According to local history and lineage books, Willie had quite the reputation for hard drinking, hard living, partying (18th Century Style), and sleeping around. An unmarried man, prone to excessive drinking, with a property filled with young enslaved women doesn’t require much in the way of math. However, conjecture isn’t proof. Willie never married and left no known white children. If he had other enslaved children, presuming he is indeed the father of Eliza, I have yet to come across their living descendants in my DNA matches. This is an unfortunate wrinkle. To-date, the team has identified white enslaving father’s of my mulatto answers by comparing my DNA to that of their white descendants, alongside a paper trail. The best we can hope to achieve is triangulating matches with the white descendants of his siblings, which is going to be tricky at best. It’s always best to compare DNA to descendants of the individual you’re looking at. Going further back in time, my DNA trail leads back to Thomas “The Immigrant” Christian – a man who has presented a centuries old brick wall. I’ll be writing about the research I’ve been doing in the Isle of Man Christian family in my next article. Yes indeed, the team is trying to smash through this most stubborn of brick walls. This is yet another example of why it’s important to use a well-researched paper trail with DNA. DNA alone could never answer the research questionof how, exactly, I connect to the Christian family. The best DNA can do is point towards specific avenues to research. There’s rarely an “ah ha, this is your ancestor” moment when it comes to DNA alone. 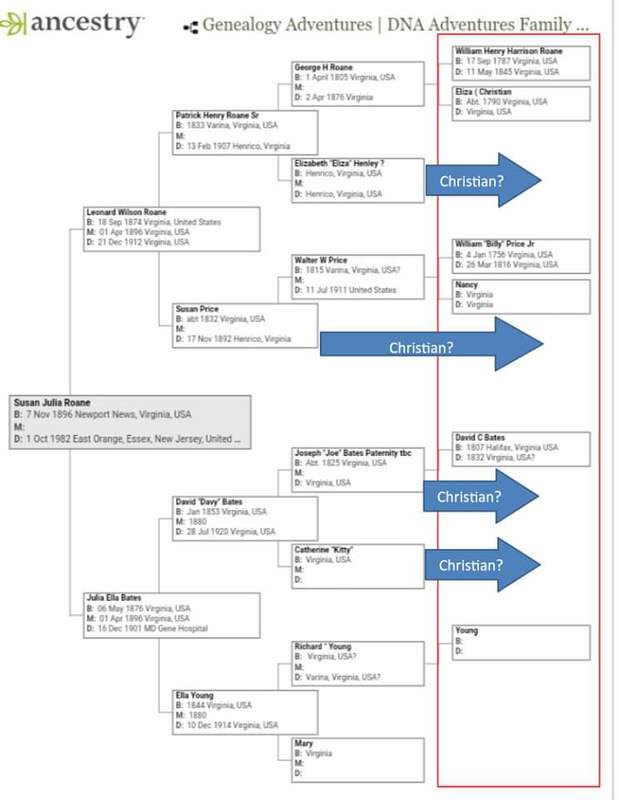 Without a well developed and researched Christian family tree in Virginia, I wouldn’t have a clue about which ancestral Christian family line to interrogate further, much less specific individuals to research. If there’s any central message to be taken from this case study, let it be that. DNA is but one hand, a paper trail is another. Both are needed. I enjoy your blog and research so much. I have no doubt you are related to Fletcher Christian’s family. Thank you for sharing!